How do we know who these Saints are? How does the Church 'decide' who becomes a Saint? What are the 'hall-marks' of a Saint? The English countryside is serenely beautiful most of the year; especially at Easter time. Even that moody English weather, for all its temperamentality, manages to cause a symphony of luscious foliage and gentle green meadows which blend with a tranquil array of colour and natural splendour. I know, because I was there in 1971, visiting a friend in Oxford who was completing his doctorate at the time. Dimitri Conomos, formerly a member of this very Parish, (and for us, still a cherished member) has long since become a Professor and is a world authority on Orthodox musicology. During my short stay in Oxford, as so many do in that part of the world, we took a care-free bike-ride through the scenic surrounds. We stopped at a quaint thatch-roofed pub by the banks of the Cherwell River for a taste of traditionally un-refrigerated beer, then proceeded on our excursion till we came upon a small but welcoming church dedicated to St Frideswide. Dimitri pointed out to me that St Frideswide was martyred in the 8th century and was recognized as a saint by the Church of England. However, I was slightly taken aback when he suggested to me that we should regard St Frideswide as an Orthodox saint since she died for Christ during the first millenium when the Church was not yet divided; a period when East and West, Rome and Constantinople, shared the One, Holy, Catholic and Apostolic Faith, despite the prevailing cultural and linguistic differences. Since then, I must admit, whenever the subject of Saints has arisen, I have always felt a degree of nostalgia for this particular saint who has come to symbolize, for me, at least, the heartache caused by the departure of former sister-Churches from the True expression of the Christian Faith. Nonetheless, in researching this evening’s talk, I have found that St Frideswide was martyred in 735 A.D. and is actually considered the patron saint of the city of Oxford. According to accounts of her life, she was the daughter of Didanus, a Mercian prince, and after taking a vow of virginity, fled to Oxford to avoid marriage with a neighbouring royal, King Algar. There, after taking refuge for three years in a village named Benton (perhaps Binsey), she founded a nunnery over which she became abbess. A Monastery bearing her name is known to have existed in Oxford before the Conquest. Her shrine became a place of pilgrimage until its later spoliation. Twice a year her shrine was solemnly visited by the university and in 1434 Archbishop Henry Chichele of Canterbury ordered her feast (October 19th) to be observed as that of the patroness of the university. Her festival was abolished by the Church of England in 1549, but it continues to appear in the Oxford University Calendar. Could it be, however, that St Frideswide still remains within the love of Orthodoxy? Could it be that the commemoration of her martyrdom is not beyond the spiritual bounds of Orthodox contemplation on sainthood? Hopefully, her memory as a faithful servant of Christ will not be lost entirely as we commence the challenging examination of tonight’s subject. To have a clearer understanding of what is to follow let us look at the derivation of the word “saint”. The English word comes from the Latin sanctus meaning “holy”. The word “saint” in Greek, «άγιος», is derived from the verb άζω or άζομαι which literally means one who is overcome with awe, fear, respect or one who has a disposition of reverence towards someone else. In the classical Greek context, the word «άγιος» was used in reference to objects which were allowed to come into contact with the “divine”. From amongst the tragic writers, Thespis, who staged the first known dramatic performance in Athens during the first part of the 6th century, speaks of «βωμούς αγίων» (sanctuaries of the holy). From the 5th century B.C., the adjective «άγιον» is steadily used in the worshipping language of the Ionian and Attican dialects. Herodotus, for whom the word signifies a sacred place, speaks of «αγίου ιρός», a holy one’s altar, and «αγίου άλσος», a holy one’s grove. Similarly, Plato speaks of «άγιος τόπος», a sacred place, Aristophanes speaks of «άγιαι τελεταί», sacred rituals, Demosthenes speaks of «αγιώταται τελεταί», most holy rituals and «αγιώτατοι βωμοί», most holy sanctuaries, «άγια και σεμνά ιερά», holy and solemn sanctuaries, Isocrates refers to «τα αγιώτατα των ιερών», the holiest of sanctuaries, whilst Pausanias refers to «ιερόν άγιον» the holy altar. The word occurs more frequently during the Hellenistic period, after the death of Alexander the Great, in the 3rd century B.C., when the oriental notion regarding holiness begins to influence its usage. Consequently, during this period, gods are characterized as holy, especially Egyptian and Syrian gods such as Isis, Serapis and Baal. The same influence was exerted upon the Roman usage of the word “sanctus” in referring to gods as “holy”. It appears that these foreign contexts eventually led the ancient Greeks to refer to their own gods as “holy”, especially in their ritualistic worship. Yet, although the Greeks used the word «άγιος» to describe sacred places, religious ceremonies and gods, the word was never used to denote a person who engaged in, studied or philosophized these issues. For such a person the Hellenes reserved the appellation «σεμνός» which means modest, grave, solemn or stately. Later, in translating the Old Testament from the Hebrew to Greek, the 72 translators, chose the word «άγιος» to best reflect the Hebrew adjective kadosh or the noun kodesh meaning “holy” or “sacred” or “a holy person”. The Greek translators adhered strictly to the Hebrew context of holiness as well as to its Semitic adaptation. Possibly, even the words “kadosh” and “kodesh” are of Canaanean origin, which means that its usage in the Hebrew was also probably influenced by an external religious environment. 1. Yahweh (God) is holy. “For I am the Lord your God. You shall therefore consecrate yourselves, and you shall be holy; for I am holy [άγιος] ” (Leviticus 11:44). Even more strikingly, according to the prophet Isaiah who places holiness at the epicentre of his theology, God is not merely holy, but thrice holy - “Holy, holy, holy, is the Lord of hosts; the whole earth is full of His glory!” (Isaiah 6:3). In effect, he is Holy, multiplied by Holy, multiplied by Holy, thus signifying, by this triple repetition, the infinite holiness of God. 2. The Angels are also characterized by the same adjective. “Then I heard a holy one [άγιος] speaking; and another holy one said to that certain one who was speaking, ‘How long will the vision be’….” (Daniel 8:13). 3. The Priests called to the service of God are also called holy - “And the Lord said to Moses, ‘speak to the priests, the sons of Aaron, and say’….they shall be holy to their God and not profane the name of their God, for they offer the offerings of the Lord made by fire, and the bread of their God; therefore they shall be holy [άγιοι] ” (Leviticus 21:6). 4. Those who worship God are called saints in the Psalms of David – “As for the saints [άγιοι] who are on the earth, ‘they are the excellent ones, in whom is all my delight’….” (Psalm 16:3). Generally, the Israelites, in contrast to the gentiles (the non-Hebrews) are called holy – “But the saints [άγιοι] of the Most High shall receive the kingdom, and possess the kingdom forever, even forever and ever” (Daniel 7:18). The divine command “be holy [άγιοι] , for I the Lord your God am holy” (Leviticus 19:2) applies to all Israelites. Thus, the entire people of Israel are holy – “For I am the Lord who brings you up out of the land of Egypt, to be your God. You shall therefore be holy [άγιοι] for I am holy” (Leviticus 11:45). Even further, Israel is referred to as a holy nation – “And the Lord said [to Moses]…Thus you shall tell the children of Israel …. you shall be to me a kingdom of priests and a holy [άγιον] nation” (Exodus 19:6). The consequences of being such a nation, however, also obliges it to obey strictly the requirements of God, as is found in Leviticus 19:3-18. 5. The places and objects dedicated to God are also called holy. The part of the portable Temple reserved for the altar table with the seven lamps was called holy, whilst the place where the Ark of the Testimony was kept is referred to as the “Holy of Holies” [άγια των αγίων] (Exodus 26:34-35). Also Mount Horeb, “the mountain of God”, where the first theophany or epiphany occurred, is called holy. When God appeared to Moses in the form of a burning bush which was not consumed by the fire, He spoke to him saying “Do not draw near this place. Take your sandals off your feet, for the place where you stand is holy [άγιον] ground” (Exodus 3:5). From these examples taken from the Old Testament, before Jesus came into the world, we can see that the terms «άγιος», «άγιον», «άγια», in their translation to English are interchangeable for ‘holy’, ‘holiness’, ‘sacred’ and ‘saint’. 1. 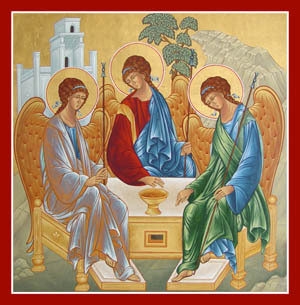 The Tri-hypostatic God (the Holy Trinity) Father, Son and Holy Spirit. “Holy, holy, holy, Lord God Almighty, Who was and is and is to come” (Revelation 4:8). God the Father, to whom His only-begotten Son prays, before his crucifixion, for the unity of the believers, is called holy – “Now I am no longer in the world but these [faithful] are in the world and I come to you. Holy Father [Πάτερ άγιε] , keep, through your name, those whom you have given me, that they may be one as We are one” (John 17:11). God the Son is referred to as “the Holy One [άγιος] of God” (Mark 1:24), and as “holy and just” (Acts 3:14). Jesus is the Son whom the Father has anointed as his “holy Servant” (Acts 4:27) and who reveals signs (miracles) among His people. Finally, holy is God the Holy Spirit, also, (Matthew 1:18, 3:11) who “teaches [the persecuted] in that very hour what you ought to say (Luke 12:12), who strengthens the Apostles (John 5:8) and who spiritually anoints the believers (1 John 2:20). 2. Just as in the Old Testament, so in the New Testament, Angels are characterized as holy [άγιοι] . On the day of the Second Coming, “the Son of man will appear in His glory and all the holy angels with Him (Matthew 25:31). “He [will come] with ten thousands of His saints” (Jude v. 14) and will judge the world “in the presence of the holy angels” (Revelation 14:10). 3. The Prophets likewise are called holy. God speaks “by the mouth of His holy [αγίων] prophets (Luke 1:70) and also speaks “by the mouth of all His holy prophets since the world began” (Acts 3:21). 4. The Apostles are called holy. The grace of God “has now been revealed by the Spirit to His holy [αγίους] apostles and prophets” (Ephesians 3:5). 5. The Apostle Paul characterizes all Christians as “holy [άγιοι] and without blame” (Ephesians 1:4). Further, he commands them to be “holy and without blame and above reproach” (Colossians 1:22) and exhorts them to live and conduct themselves “as is fitting for saints [τοις αγίοις] ” (Ephesians 5:3). In addition, the Apostle Peter, traveling through Judea, Galillee and Samaria, comes down “to the saints [αγίους] who dwelt in Lydda (Acts 9:32) and proceeds to neighbouring Joppa where he resurrects from the dead a woman apostle named Tabitha in the presence of “the saints [των αγίων] and widows” (Acts 9:41). 6. Only once is the word «άγιος» used to denote a particular person – John the Baptist whom Herod was afraid of, “knowing that he was just and holy” (Mark 6:20). 7. In the New Testament, Mount Tabor, where Christ was Transfigured and surrounded by Divine Light, is called holy [άγιον] (2 Peter 1:18). Heaven, where God dwells and where the throne of his Kingdom abides, is also called holy, for “with His own blood, [Jesus] entered the Most Holy Place once for all, having obtained eternal redemption” for those who seek forgiveness of sins. 8. Finally, the Sacred Books are called holy [γραφαίς αγίαις] (Romans 1:2) as well as the Commandments of God (2 Peter 2:21). So, in the New Testament, the terms «άγιος» and sanctus are equally interchangeable in English with the terms holy, holiness, sanctity, sacred and saint. In Patristic terminology the adjective «άγιος» is rendered primarily to God as the essence and source of all holiness. For God alone is “Lord, holy and true” (Acts 6:10) upon whom every holy and sacred element of the world is dependent, since it can never be holy of its own, but only through “participation” (μέθεξις) in the holiness of God. Even the terms kadosh, άγιος, and sanctus presuppose a relationship of absolute dependency on God. From the time of St Irenaeus, however, in the second century, the characterization “saint” is applied to all those men and women who, drawing their holiness from God, the only source of holiness, through their active faith and love accomplished “likeness” with Him and “found favour before God” (Acts 7:46). Essentially, then, the term “saint” points to the “person of God” (3 Kings 13:24), the “friend of Christ” (in the words of St John of Damascus) who, through perfect love for God and through obedience to the Divine Law, has been sanctified and divinized, both in spirit and in body, and has been glorified by God, receiving from Him the grace of working miracles and the power to intercede for us. One must strive heroically to live a life in imitation of the divine holiness, but sanctification itself is the work of the Holy Trinity. Through the power and action of the Holy Trinity all Christians are called to be saints. In the early Church, all who were baptized in the name of the Holy Trinity, who received the Seal of the Spirit in Chrismation and who participated in the Holy Eucharist, were called “saints”. In this same spirit St. Paul, when writing to the Churches he had visited, calls all the faithful “saints”. Writing to the Ephesians, he addresses his Letter “to the saints who are in Ephesus, and faithful in Christ Jesus” (1:1); writing to the Corinthians he uses the same expressions “to the church of God which is in Corinth, with all the saints who are in [the province of] Achaia” (2 Cor. 1: 11). St. Basil, commenting on these Scriptural remarks, explains that St Paul, in referring to the “saints” of the local Churches with whom he is communicating, “means all those who are united with God, who is the Being, the Life and the Truth” (Against Eunomius, II, 19). Furthermore, St. Paul writes to the Colossians that God has reconciled men by Christ's death, “so that He may present you before Himself holy, without blemish and innocent in His sight” (1: 22). However, in the early Church, whilst it was understood that one could not be a member of the Church without being a saint, just as today, the term was used particularly to distinguish the first Christians, especially the members of the community in Jerusalem. In Antioch, even from the days of the Apostles, the members of the Church, overall, were soon referred to as “Christians”. The term “saint” was eventually used to especially honour the martyrs who were persecuted and killed for the name of Christ. Later, an ever-increasing line of exemplary Christians, sanctified by the power of God within them, also came to be known as “saints”. 1. First amongst all the Saints of the Church is a woman – the Holy Theotokos, the Mother of our Lord, and Ever-Virgin Mary. She belongs to no group, for she stands alone “more honourable than the cherubim and beyond compare more glorious than the seraphim”. The Theotokos is the “chosen vessel” through whom the perfect union of divine and human in Christ was effected. She is not a god. She is not a demi-god. She is entirely human. However, Her degree of holiness far surpasses that attained by any other human being. 2. The Apostles, who were called by Christ to His service and who received the great command to evangelize the world, thus establishing the Church. They were the first to spread the message of the Incarnation of the Word of God and of salvation through Christ. 3. The Prophets, who were chosen by God as His spokespeople through the ages. They led the people of God to the path of salvation and prophesied, in different eras, the coming of the Messiah. 4. The Martyrs, men and women, who sacrificed their lives whilst fearlessly confessing Jesus Christ as the Son of God and the Saviour of humanity. 5. The Fathers and Bishops who excelled in defining and defending the Christian faith, by word and deed, through Ecumenical Councils, through their writings and through their boldness before rulers and heretics. 6. The Monastics, men and women, who lived in the desert and dedicated themselves to spiritual exercise (άσκησις), reaching, as far as possible, perfection in Christ. 7. The Just, men and women, who lived in the world, leading exemplary lives as clergy or laity with their families, becoming examples for imitation within the Church and society. All these saints had their own calling and characteristics: they all fought the “good fight for the faith” (1 Tim. 6:12 and 2 Tim. 4: 7) and all applied in their lives the scriptural virtues of “justice, piety, fidelity, love, fortitude, and gentleness” (1 Tim. 6: 11). From the earliest days of the Church, each local Church, under the supervision of the Bishop, compiled catalogues or lists indicating each known case where a Christian was martyred (killed) for the Faith. These lists were called Martyria and were accompanied by a brief account of the martyr’s life and the circumstances of his or her martyrdom. Further they made mention of the manner in which each particular martyr was arrested, tried and executed. There were two types of Martyria: a) the official transcripts which record the court proceedings under a proconsul or a number of judges (acta proconsularia), either in their original form, or with elaborations added by a Christian hand, and b) accounts of the trial and death of the martyr recorded in the form of letters written either by eye-witnesses or by auricular (ear-witnesses). These had a liturgical character and were often used in the Services of the early Church for the inspiration of the faithful. In time, the Martyria were succeeded by the Martyrologia which are distinguished into general and local records compiled from the existing Martyria. Originally, under the term Martyrologia were recorded all accounts which related to the life and the martyrdom of a particular member of the Church. East and West, when speaking of Martyrologia meant precisely those accounts which could also take the form of a eulogy, a panygeric sermon, or a lengthy exposition on the life of the martyrs. These detailed accounts were duly summarized and recorded in chronological order thus forming the Martyrologia which were the most representative type of ecclesiastical calendar in the Ancient Church. Of the many Martyrologia, perhaps the most important was the Eastern Martyrologion, compiled in Greek in the 4th century and distinguished by its order and precision. This was later translated into Syriac then, eventually, other languages as well. Parallel to these were the Calendaria which were ancient accounts not restricted merely to the dates and places where martyrdoms occurred but which also included a record of other significant social or secular events of that period. Additional records were catalogued in the Diptychs of the Martyrs – the word ‘diptych’ comes from the Greek «δίπτυχα», literally meaning two panels joined by by hinges thus enabling them to be folded as two thick pages of a book. Upon these diptychs were recorded the names of the martyrs and preserved in each local church. Some diptychs took the form of icons. Alongside these were the Episcopal Diptychs also. These were the lists of the canonical Bishops of each regional Church who had departed from this world which certified the Apostolic Succession of their Ordination – a practice that continues till today thus making it possible to trace the status of a given Bishop and to verify whether he, and his immediate successors are canonical or not, i.e. authentic or false. With the Edict of Milan, issued by Constantine the Great in 313, granting freedom of worship to all religions, including Christianity, it was inevitable that a chart of Feast Days called the Eortologion would be compiled. This important book records the lives of the martyrs, the commemoration of Saints, the celebration of Despotikes and Theomitorikes Eortes (Feast Days focusing on Jesus and the Mother of the Lord), as well as various events directly related to the life of the Church or the experiences of the faithful, such as the consecration of church buildings, miracles, earthquakes etc. With the passage of time other liturgical and hagiological books were published. These include the Synaxaria (from the Greek word ‘synaxis’, meaning a gathering, and in this case a ‘gathering’, a compilation of detailed accounts of the lives of the Saints). Although they still remain as historical records of the Church’s Saints, the Eortologia were replaced by the Menaia or Menologia which are a set of twelve books, one for each month, containing not only the names of the Saints commemorated each day, but also a summary of each Saint’s life and the hymns to be chanted in honour of each Saint during Vespers, Matins and the Divine Liturgy. These are the books used today in the Orthodox Services. The Menologia, by no means exhaustive, are a compilation of the Saints from all the regional Churches, who, whilst distinguishing themselves in particular areas, came to be accepted universally by the Orthodox Church. 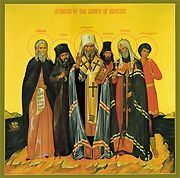 Undoubtedly, however, the Church is mindful that many Saints are not included in the current Menologia of Eastern Orthodoxy. For this reason, special committees from the various Patriarchates continue to gather information in an attempt to include all the Saints of the Undivided Church of the first millennium and to update the list of Saints after the Schism of 1054 till today. In this context, then, perhaps St Frideswide might one day also be included in the Menologin of the One, Holy, Catholic and Apostolic Church, when a myriad of Saints from the Christian East and the Christian West, not yet recorded officially, are finally entered into the Menologion. When St Paul was writing to the Christians of Rome or Corinth, reminding them that they are “called to be saints”, he was not writing to people “likely to figure in stained-glass windows” or on iconographic walls but to what one contemporary theologian describes as “a motley collection of shop-keepers, minor civil servants, converted prostitutes, prize fighters and slaves”. They came from every class and occupation, from every temperament and background. They did not walk the streets with halos glowing. The Saints were just as human as we are. Men, women and children. Married and celibate. Clergy and lay people. They were sinners, just as we are. But, by the grace of God, they were “washed and sanctified” and remained so till their departure from this world. One extraordinary experience, common amongst many Saints, is that of Theosis or Deification. What is this and where do we base it in the Scriptures? In the Old Testament, you will recall, God spoke to His people through Moses saying “For I am the Lord your God. You shall therefore consecrate yourselves, and you shall be holy; for I am holy (Leviticus 11:44). However, in the New Testament, Jesus, following the ultimate Commandment of Love which requires the believers to forgive even their enemies, went not one, but infinite steps further, when he preached the Beatitudes in the Sermon on the Mount, and directed all who would follow Him, not just to be holy, but to “be perfect, just as your Father in Heaven is perfect (Matthew 5:38). Is it not enough to be a good person, “minding one’s own business, not hurting anyone, not wronging anyone”? That might be a reasonable starting point, but certainly not enough, according to Jesus! Is it not enough to be holy? Yes, if one can attain holiness, then most certainly one can be saved and thus enter the Kingdom of Heaven. But who can be perfect? Realistically, is this attainable? Theosis (in Greek) or Deification (in English) are the ancient theological words used to describe the process by which a Christian becomes more like God. St Peter speaks of this process in the New Testament when he writes, “Grace and peace be multiplied to you in the knowledge of God and of Jesus our Lord, as His divine power has given to us all things pertaining to life and godliness….that we may be partakers of the divine nature..” (2 Peter 1:2-4). What does it mean to be partakers of divine nature and how do we experience this? When the Church calls us to pursue godliness, to be more like God, “this does not mean that human beings become divine. We do not become like God in His nature. That would not only be heresy, it would be impossible”, for, as humans, we cannot participate in God’s essence or nature because, in such a case, “the distinction between God and man would be abolished”. What this does mean is that we can participate in God’s divine energy, described by a number of terms in Scripture, such as glory, life, love virtue and power. We are to become like God by grace, and truly His adopted children, but we never become God by nature. According to some Church Fathers, this transformation especially occurs through the Holy Eucharist (Holy Communion), “for when Christ’s Body and Blood become one with ours, we become Christ-bearers and partakers of the divine nature”. Through knowledge and the cultivation of a progression of spiritual qualities, especially humility, obedience, love, moral excellence and self-control, some Saints of the Church, even some who are living today on Mount Athos in Greece, and elsewhere in the world, reached such an advanced stage of purity that they were surrounded by the energy of God and during moments of prayer that could last for days, according to eye-witnesses, were elevated by God off the ground as they knelt in silence, surrounded by Divine Light. Historically, Theosis has often been likened to a sword in the fire. A steel sword is thrust into a hot fire until the sword takes on a red glow. “The energy of the fire interpenetrates the sword. The sword never becomes fire, but it picks up the properties of the fire”. Likewise, being joined to Christ, our humanity can be interpenetrated with the energies of God. Central to Orthodox faith and practice is the belief that Christ is the One and only mediator for the reconciliation of humanity with God. The intercessions of the Saints “do not lessen or limit the redemptive work of Christ as the only Mediator between God and man”. Whilst there are many intercessors who pray for us in Heaven, they cannot grant us salvation! They can only intercede for us through the one and only Mediator who can forgive and redeem us - our Lord and Saviour Jesus Christ. However, just as the living members of the Church pray for one another, which does not offend or violate the truth of Christ as the One and only Mediator, so also, the Saints in heaven pray for the living. The claim by non-Orthodox that the Saints in Heaven, as human, are not able to know the needs of the members of the Church on earth is not justified, because the angels, who are also created beings, do know the needs of man and serve them (Zechariah 1:12-13, Luke 15:10 and Revelation 8:4). The Orthodox practice of seeking the prayers and intercessions of the Saints is not only a fundamental aspect of Holy Tradition, which is the on-going life of the Church, but is also prefigured in the Scriptures. By Saints we are to understand not just those in heaven but the Saints on earth as well. In the New Testament, Jesus, while enduring “extreme humiliation” on the Cross, prayed to His Father…., “then an angel appeared to Him from heaven, strengthening Him” (Luke 22:43). Seeing, therefore, that Christ Himself was strengthened in His agony by an angel, how could it be improper, as some non-Orthodox say, for the members of the Church to call upon the assistance of the Saints in their supplication to God? If the Saints’ prayers to God had such power or influence when they were yet on earth, how much greater must their influence be after their departure from earth? This prompts St Paul to explain, “Truly, now we see things dimly, as through a metallic mirror. Then we shall see God face to face. For now I know only in part, but then I shall know in fullness, just as God has also known me” (1 Corinthians 13:12). A most tangible example of a saint interceding to God on behalf of the people occurred when Christ was present at the marriage in Cana of Galilee. “When the wine gave out”, we read in the Scriptures, “the Mother of Jesus said to Him, ‘They have no wine’….” And after initially questioning the timing of His mother’s request, observing that she had already instructed the servants to do whatever He was to tell them, Jesus turned the water into wine (John 2:3-9). This sign was the first manifestation of Christ’s glory as perfect God and perfect Man in what is termed a ‘miracle’. He responded to the request of his Mother who, apart from being truly the Theotokos, was also a saint of the first Christian community. St Paul, writing to the Greek-speaking Jews in Palestine, exhorts them to “remember your leaders [i.e. the leaders of the Sacraments, the Bishops and Presbyters] who spoke the word of God to you. Observe how their lives ended and follow the example of their faith” (Hebrews 13:7). Elsewhere, St Paul praises the Christian communities “Having heard of your faith in Christ Jesus, and the love which you have for all the saints (Colossians 1:4). In the Old Testament we are told that “the memory of the righteous is blessed, but the name of the wicked will rot” (Proverbs 10:7). This was emphasized remarkably when Judas Maccabeus, a spiritual leader of the Jews, with his people under threat of slaughter by the arrogant Nicanor, prayed to the Lord for help. The Jews could not fight because it was the day of the Sabbath. Unwavering in his faith, Judas Maccabeus strengthened his men by relating the following vision: “Onias, who had been high priest, a noble and good man….was praying with outstretched hands for the whole body of the Jews….Then likewise there appeared a man….of marvellous authority….And Onias spoke and said, ‘This is Jeremiah, the prophet of God, who loves the brothers and prays fervently for the people of the holy city’. Jeremiah stretched out his right hand and gave to Judas Maccabeus a golden sword, and as he gave it he addressed him thus: ‘Take this holy sword, a gift from God, with which you will strike down your adversaries’…” (2 Maccabees 15:12-16). How marvellous is the power of God’s word! Both Onias the high priest and Jeremiah the prophet, Saints of the Old Testament, departed centuries before the attack on Judas Maccabeus, prayed from the heavens for the people and for the holy city. And, as we have just heard, the Prophet Jeremiah presented a material gift to Judas Maccabeus from God out of the immaterial heavens! Also, Moses pleading with God to have mercy on His people, prays thus, “Remember your servants Abraham, Isaac and Jacob; do not look on the stubbornness of this people, or on the wickedness of their sin” (Deuteronomy 9:27). Of course, Abraham, Isaac and Jacob had long preceded Moses to the invisible world where they continued to exist with God. St Paul asks for “the supplications of the saints” in Ephesus, Thessalonica, and Rome. (Ephesians 6: 19, Thessalonians 5: 25; Colossians 4: 3, and Romans 15: 30-31). It is, therefore, not surprising that, in every Liturgy, we ask God the Father to accept, on our behalf, “the prayers and the intercessions” of all the Saints who now live in heaven. The Fathers of the Church accept as a matter of course the prayers and the intercession of all the saints. 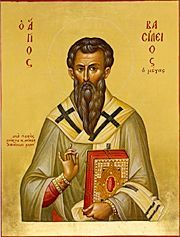 For example, St Basil explicitly writes that he accepts the intercessions of the apostles, prophets and martyrs, and he seeks their prayers to God (Letter 360). Then, speaking about the Forty Martyrs, who suffered martyrdom for Christ, he emphasizes that “they are common friends of the human race, strong ambassadors and collaborators in fervent prayers” (Chapter 8). St Gregory of Nyssa asks St Theodore the Martyr “to fervently pray to our Common King, our God, for the country and the people” (Encomium to Martyr Theodore). The same language is used by St Gregory the Theologian in his encomium to St Cyprian. St John Chrysostom exhorts us to seek the intercessions and the fervent prayers of the saints, because they have special “boldness” (παρρησία), before God. (Gen. 44: 2 and Encomium to Julian, Iuventinus and Maximinus, 3). This intercession is an ongoing feature of what the Fathers call the “Communion of the Saints”. In simple terms, this means that the saints who belong to the Visible Church on earth pray for the Saints who belong to the Invisible Church in Heaven. At the same time, the Saints in Heaven pray for the saints on earth. This “communion” through prayer is a constant interaction which demonstrates the unity of the Church. Whether one is in the Visible Church or the Invisible Church, the Church is one. It functions on earth but extends beyond time and matter to eternity. In the Orthodox Church we seek the intercessions of the Saints but do we worship them? The answer is, no! We do not worship the Saints. We venerate them. Uninformed non-Orthodox Christians, seeing us crossing ourselves and kissing the holy icons, presume that we are contravening the Commandments of God. In the Orthodox Church worship (λατρεία) is given to God alone. Worship is completely different from the honour (τιμή), the love (αγάπη) and veneration (προσκύνησις), “paid to all those endowed with holy dignity” (St John Chrysostom, Hom. III, 40). The Orthodox honour the saints to express their love and gratitude to God, who has “perfected” the saints. 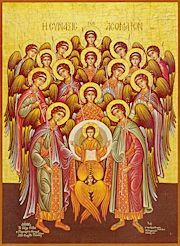 As St Symeon the New Theologian writes, “God is the teacher of the Prophets, the co-traveller with the Apostles, the power of the Martyrs, the inspiration of the Fathers and Teachers, the perfection of all Saints….”(Catechesis, I). But why do we bow down to the icons of the Saints when we venerate them? Is this justified by the Scriptures? Yes, it is! The Holy Bible mentions in many places that saints were venerated or that homage was paid to them by the bowing down of the body as a sign of honour and respect, but not as an act of worship. For instance: As Elijah and Elisha walked by the banks of the River Jordan, the Lord took Elijah into heaven by “the chariot of Israel and its horsemen”. Then Elisha took the mantle of Elijah which had fallen from him and struck the water [of the Jordan] and said ‘where is the Lord God of Elijah?’ And when he had struck the water, the water was divided to the one side and to the other; and Elisha crossed over. Now when the sons of Jericho saw him they said, ‘The spirit of Elijah rests with Elisha’. And they came to meet him and bowed to the ground before him” (2 Kings 2:12-15). So, here is a case of men bowing down to a saint in their midst. Elsewhere we read, “And it came to pass, when Joshua was by Jericho, he lifted his eyes and looked, and behold a man stood opposite him with his sword drawn in his hand. And Joshua went to him and said, ‘Are you for us or for our adversaries?’ So he said, ‘No, but as Commander of the army of the Lord I have now come’. And Joshua fell on his face to the earth and paid homage to him….” (Joshua 5:13-14). Here is a case of a man bowing down to an Angel, an Archangel. Paying veneration to the Saints does not preclude paying worship to God, just as love for our fellow human does not detract from our love for God. If God commands us to show respect to our parents in the flesh, clearly we ought, all more, do the same as regards our spiritual fathers and mothers. This is clearly shown in the New Testament where we read, “As Peter was coming in, Cornelius met him, and fell down at his feet and paid homage to him” (Acts 10.25). Most strikingly of all, though, in the Book of Revelation, John the Apostle and Evangelist and Theologian, having been addressed by an angel of God, writes “And I fell down at his feet to pay homage to him. And he said to me, ‘See that you do not do that! I am your fellow-servant, and of your brethren who have the testimony of Jesus’….” (19.10). Remarkably, however, despite this injunction by the angel not to venerate him, John the Evangelist again fell down and paid homage to him (Revelation 22:8). Surely he would not have done this had it been unlawful. In the Orthodox Church, then, we worship God alone. When we venerate or kiss an icon of a Saint, a member of our family which extends to Heaven, the honour passes over to the prototype, the original in Whose image all the Saints are created. The early Christians commemorated not the birth day of the saint but the day on which the saint departed from this world. On that day the synaxis of believers gathered around the tomb of the saint or in the house-church where the holy relics were preserved and guarded. After the era of persecutions finally closed, the holy relics were placed in churches with great historical and theological significance. Such a gathering, called a feast-day or festival (πανήγυρις), commemorated the memory of the saint. The faithful participated in these feasts to listen to an encomiastic speech praising the deeds or the martyrdom of the venerated saint and, in general, to derive spiritual profit. Interesting information on this subject is found in the “Martyrdom of St Polycarp”, an early Christian work, (ch. 17-18), according to which the early Christians reverently collected the remains of the saints and honoured them “more than precious stones”. They also met on the day of their death to commemorate “their new birthday, the day they entered into their new life, in Heaven”. To this day the Orthodox have maintained the liturgical custom of celebrating the Saint’s memory on the day of his/her death, of building churches honouring their names, and of paying special respect to their relics and icons. The Fathers, and all early Christians in general, paid especially great respect to the relics of the martyrs. In addition to the sources already mentioned, Eusebius of Caesarea, the Church historian, writes that “those who suffered for the glory of Christ always have fellowship with the living God” (Church History, 5: 1). In the Apostolic Constitutions (5: 1) the martyrs are called “brothers of the Lord” and “vessels of the Holy Spirit”. This helps to explain the special honour and respect which the Church paid to the relics of the martyrs. St. Basil the Great, St. Gregory of Nyssa, St. Cyril of Jerusalem, and St. John Chrysostom remind us that the relics of the martyrs “are filled with spiritual grace”, that even their tombs are filled with a special “blessing”. This Patristic practice still continues today, and people from all over the world visit churches that possess the relics of martyrs and saints. Also, according to the ancient tradition, the consecration of new churches takes place with the deposition of holy relics in the Holy Table of the sanctuary. According to the Orthodox belief, the body remains a Temple of the Holy Spirit even after death until the Second Coming of Christ when all human bodies, regardless of their manner of death will be resurrected. It is therefore, “only fitting that Christians show respect for the bodily remains of the Saints. Reverence for relics is not the fruit of ignorance and superstition, but springs from a highly developed theology of the body”. Great controversies have occurred in the past over the special honour due to the icons of Christ as well as those of the saints of the Church. The Iconoclastic controversies which began in Byzantium in the seventh century shook the entire church. The Fathers of the Church, however, declared quite clearly that the honour belongs to the “prototype” and not to the material image of Christ or the Saints. Some would say that “a Saint is a person, now dead, whom the Church allows to be publicly venerated”. The Church reckons as Saints those virtuous Christians to whom God gives exceptional gifts of charisma (χάρισμα), grace, by which they excel in love for God or by which they endure torture in martyrdom. These gifts, ordinary or extraordinary, are endowed by God alone. They constitute God’s energies, and uncreated energies at that. In other words, they reflect the inner power of God which was characteristic of His nature before He created the material world and which will continue to characterize Him after the abolition of this world. God’s energy is not dependent on created matter. God is God because He is “He who is” [O ΄Ων] (Exodus 3:14) i.e. He who is at all times; He who is not governed by time but is eternal. Consequently, the power shown by a persecuted Christian in enduring torture and martyrdom is a gift, a grace from God. The ability of the Great Fathers and Teachers of the Church to delve deeper into the truth than their contemporary theological writers, is due to an increased enlightenment, which they obviously sought, but which was granted to them by God the Holy Spirit. The theoptic experiences of the distinguished athletes of spiritual exercise and prayer are given by God. The charisma of virtuous Christians to comfort their fellow-human by miraculous actions, to heal them and to strengthen their faith, is owed exclusively to God. This individual gift is not theirs. Nor did they receive it from some Synod or Council. It is clear, therefore, that whatever grace distinguishes a Christian, or reveals that person as a Saint, has its source in God, regardless of any individual effort towards holiness exerted by that person. It is God who “shows forth”, “elevates”, “glorifies” the Saints and He demonstrates this by “paradoxical signs” which are the miracles performed by God, through the Saints. So, it is neither the Synod nor the people of a local church who “sanctify” or who are able to decide on the “sainthood” of a particular person. It is God who shares the energies of His holiness with His Saints, thus discerning them as “bearers” of his grace. In the Primitive Church, the Apostles, the Angels, the Mother of our Lord and the Forerunner of Christ, John the Baptist, were venerated as Saints, due to the obvious sainthood extended to them by God Himself as indispensable participants in the establishment of the Heavenly Kingdom on earth. No procedure was required by the Church for these Saints. God Himself proclaimed them by His word and by His action. Nor was any procedure of the Church required for the Martyrs. The faithful had been present at the martyrs’ trial and execution, and could see for themselves that they had stoutly confessed Christ and had been put to death for it. Their bodily remains had been recovered and religiously entombed. The date and the place of burial were entered on the official record of the local church by the Bishop, and the certainty of their glorification by the Lord was lived through the immediacy of this experience. The Bishop’s approval, for want of a better word, was paramount in order to avoid the veneration of bogus martyrs who were either heretics or schismatics or demagogues who created cult followings for themselves rather than for God. In such cases, the Church was quite clear. Those who did not truly live by God, those who died outside the True Faith of the Church, could not be counted among Her martyrs. In most cases a Bishop signified his approval simply by associating himself with the spontaneous acceptance of a Saint by his people, for this is the ancient practice of the Church. It was the people in whom the glorification of the Saint became manifest, through signs and miracles, who sealed the commemoration of a Saint with their conscientious approval as immediate witnesses. But how does the Church know when God has mysteriously judged one to be a Saint? What of the thousands who, though not martyred, led inspirationally saintly lives, either as Church leaders or as members of the faithful? What of the countless number of Saints whose intense inner purity remained hidden from others on earth and were never “externalized” but always known to God? Generally, this glorification becomes self-evident in the Church by means of special signs from God which certify them as Saints. 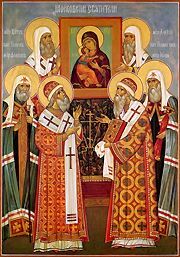 Thε Fathers of the Church with their discerning Orthodox spirit simply verify the facts already evident to the ecumenical conscience, and authorizes, through Her Bishops, the veneration of a given Saint. In fact, this glorification, local or general, has always preceded the act of the Church which confirms it. “Canonization” of Saints practised in the tradition of the West, is a procedure which the Christian East has always considered as overstating the Church’s role of “authority” in a domain which, as we have just heard, is exclusively God’s. The Western tradition of Sanctioning, Beatification and Canonization have always, therefore, been viewed with more than mere caution by Eastern Orthodoxy where the lives of the Saints “are not examined in minute detail, nor are their virtues and sins, their successes and failures placed on a scale”. The Orthodox Church maintains that we cannot reject what has been decided by God nor, on the other hand can the Church “create” a saint arbitrarily. This is foreign to the Mind and the Conscience of Orthodoxy. The Church can only “verify” and “acknowledge” what God has already manifested. From the earliest days, nonetheless, the Church had a responsibility, through Her Bishops, to ensure the “authenticity”, the “genuineness” of those counted as Saints, for it is extremely difficult to discern which miracles, or astonishing events, are caused by the Spirit of God or by the spirit of Satan. St Paul, for instance, wishing to “cut off the opportunity from those who desire an opportunity to be regarded just as we are” (2 Corinthians 11: 12), in other words those would seek to usurp the authority of the True Apostles, warned the Church of Corinth to beware of “false apostles, deceitful workers, transforming themselves into Apostles of Christ. And no wonder! For Satan himself transforms himself into an angel of light” (2 Corinthians 11:13). So the Bishops, from the outset, had to be alert and discerning. Up until the 11th century, at least, there was no set procedure for the determination of Saints. The celebration of a Saint’s memory in a local church usually commenced “spontaneously” by few or many faithful, clergy and lay people, then became accepted generally throughout the Church. Indeed, whoever looked down upon this celebration with contempt was to be anathematized, cut off from the Church, according to Canon 20 of the Council of Gangra in Paphlagonia c. 345 A.D.
Later the Patriarchates intervened in many cases, not to approve but to widen the celebration of the memory of the Saint. From the 16th century evidence of sainthood was examined by the local Synod. In the 20th century, the process of entering the names of new Saints into the Menologion is enacted by the Holy Synod of each Patriarchate and of each Independent Church. The Ecumenical Patriarchate of Constantinople, through its Great Committee on the Sciences, established in preparation for a future Pan-Orthodox Synod, is seeking to compile a comprehensive catalogue of the Saints from all the Orthodox jurisdictions. d) He/she must have rendered exceptional service to the Church either by way of the position of authority held or by the display of courage in the face of challenges to the doctrines of the Faith or in the face of martyrdom. e) He/she must have been granted leave by God to comfort the faithful or to convince the unfaithful through Miracles, which could also include the fragrance of their relics. However, not all the above conditions, or givens, though correct, effectively solve the fundamental problem: how do we ascertain who is a saint? Baptism, Orthodox phronema, a virtuous life, even exceptional services of the Church, are not qualities attained only by the Saints. Thanks be to God, millions of Christians have attained these as well. Further, the problem for the Church is not who are good Christians but which of those should be honoured as Saints? The Church needs to determine, who of the myriads of Christians, are without doubt, discernible and outstanding examples of Christ-filled lives, worthy of emulation. St John of Damscus, from the 7th century, elaborates by explaining that the par excellence Saint is one who has conquered the passions, one who has become enlikened to the image of God or has been enjoined to God, one who has partaken of divine grace, one who has become a dwelling-place for God; not one who has simply attained these marks, but one who has attained them to an exceptional degree. St John elaborates even further saying that the Saint’s participation in divine grace must also be of a degree which is unusual and exceptional. St John, experienced himself in the spiritual life, and blessed to a high degree by the Holy Spirit, hesitates to go any further, knowing that quite often the characteristics he speaks of comprise hidden circumstances which take place in the soul and are not easily subjectable to human evaluation. But whilst he admits that he is unable to determine which degree of participation in divine grace qualifies one as a Saint, he prayerfully suggests that the Saints who, whilst committing their lives completely to Christ, were endowed with so many graces, also acquired παρρησία which, in the theological language, apart from the notion of “boldness”, also means an “openness”, an “open line”, an “intimate ease of communication with God”. Because they loved God so much, they were granted the honour of speaking intensely with the Lord, praying for themselves and praying for others. This “open line” of the true Saints is exposed through the miracles produced by their intercessions for the faithful. So, besides their Orthodox spirituality, the miracles are an absolutely convincing and secure mark of the Saints, according to St John of Damscus who expresses the thinking of the Church with precision.